All systems to be serviced, maintained and certificated to BS EN 9990:2015. Dry Risers are a vital piece of fire protection equipment for buildings. They are intended mainly for the use of the Fire Brigade Service in the event of a fire. 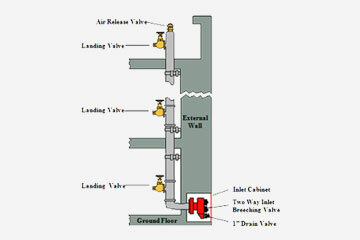 A Dry Riser allows the fire service to connect their pumps to the ground floor inlet and pump water to the various outlet landing valves at each level of the building. The riser is left in a dry condition when not in use, hence the term 'Dry Riser'. Our experienced and fully trained maintenance staff will carry out the necessary checks and pressure tests to ensure the Dry Riser system is in fully working condition for use in an emergency.